The scriptures tell us in 1 Chronicles 12:32 that the sons of Issachar not only understood the times and the seasons, but they knew what Israel was supposed to do. Today’s Briefing recounts multiple prophetic dreams and encounters that instruct us of the same. As you read, I hope you are encouraged and envisioned to help bring the “not yet” into the “now.” His-story is waiting. Within an hour after hearing this exciting dream, Lou was on the phone with Grand Chief Lynda Prince of the Carrier Sekai Nations. Lou was calling to invite Lynda to bring her 120 drums to Azusa Now. He had envisioned having 120 native drummers join with 120 Jewish shofar players in honor of the people groups of both our natural and spiritual roots. When Linda heard Lou’s request, she was astonished. She explained that in 1998 she had a visitation in which the Lord told her that when 120 drums joined with 120 shofars there would be a great awakening! On the second day of the Portland gathering, one of the prophetic intercessors was taken up into heaven where she was told, “Today is the day history books will record as the birth of the Third Great Awakening.” She shared this privately with Pastor Trujillo. 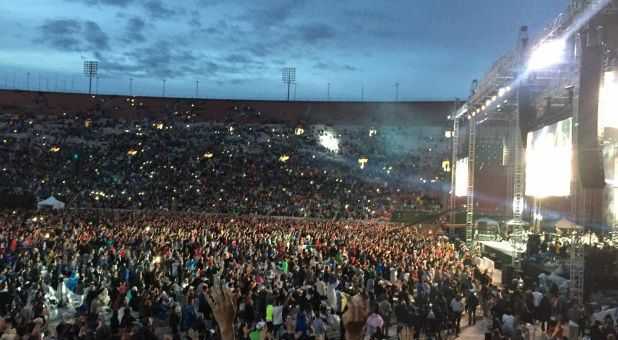 Just moments later, another leader got up on stage and prophesied, “This is the day and this is the moment that history will mark as the birth of the Third Great Awakening!” It wasn’t until then that Steve understood it was the Third Great Awakening that had been conceived at Azusa Now. That same day, over 5,000 people flooded the streets of Portland to release the gospel. The city has not been the same since. 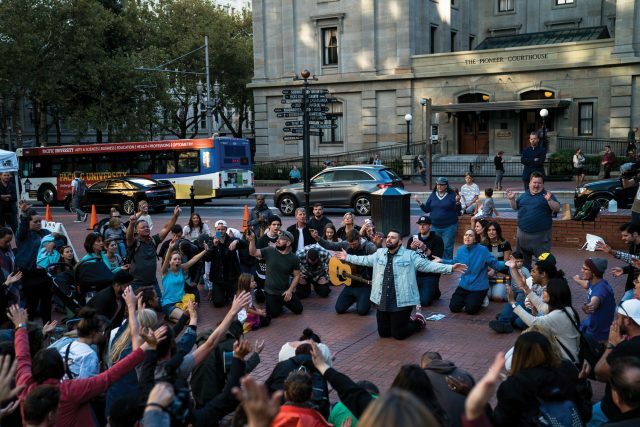 Intercessors and evangelists who have ministered in Portland for years testify that, since that gathering in 2018, Portland has been a different city where people are coming to the Lord like never before. We are convinced that what is happening in Portland is just the beginning of what God wants to do in cities across America and beyond. However, God isn’t going to do it apart from His people. Each one of you is key to awakening in your own families and regions. This is not the first time that we have been told in a dream to “command”. As you may remember from The Briefing 026, Chris Berglund dreamed that Jonathan Edwards was issuing decrees from a heavenly council room, starting with: “I command ‘the awakening time is now upon us’ to be agreed with on Earth as it is in Heaven…” Chris understood in the dream that the ekklesia on earth needed to resonate with heaven in issuing these same commands. In another recent dream, a young leader in our community experienced the Lord handing him a blank calendar that had written on it, “Now is the time of revivals and awakenings!” Why was the calendar blank? Perhaps because the dates are yet to be determined as history waits for the saints of God to release on earth what has already been determined in heaven. Jesus modeled this for us in John 11 when he went to the town of Bethany four days after his friend Lazarus had died. He explained to his disciples, “Lazarus has fallen asleep but I am going there to wake him up!” A few verses later, Jesus is standing outside Lazarus’ tomb praying aloud to his Father. He wanted everyone to know that it was the Father who had authorized what he was about to do next. Then, Jesus literally commanded Lazarus to come forth from the grave. Immediately the dead man came back to life. We know from the scriptures that Jesus the Awakener has now given the keys of the Kingdom to us. As fellow sons of the Father, we are not only to submit to His authority, we must be prepared to execute it as well. There are times to preach, times to pray, times to be still and see the deliverance of God. We may not fully understand it, but we believe the Lord is saying it’s time to command awakening! If you believe that “now is the time of revival and awakenings,” then we urge you to heed this prophetic directive and give voice to the word of the Lord in your household, your city, and everywhere you go. Copyright © 2018 The Briefing, All rights reserved.